The Golf's continued success is testament to its all-round appeal. It's practical, reliable and exceptionally well built, all of which add up to create exceptional resale values. A consistent best-seller, the VW Golf embodies good build quality, strong residual values and reliability. It's approaching its 40th birthday and shows no signs of dropping off the sales charts yet. A tremendous choice of engines, specs and body styles are available, with everything from the most innocuous of estates to the hallowed GTI in the line-up. Traditionally, the Golf has never been the most affordable of family hatchbacks, but cast iron values make it a safe place for your cash. The Golf hatchback has been around in six guises since 1974 and has since appeared as an estate, a convertible and a saloon (if you count the Jetta and Bora). Hatches are by far the most common as they're regularly close to the top of the sales charts. The MkV version we're looking at here has an utterly huge range of engines that isn't far shy of the current MkVI model's selection. Entry-level S models start with simple 1.4- and 1.6-litre engines but these were superseded by more powerful and economical TSI engines later on. The 1.9- and 2.0-litre diesels are always a good choice for economy and robustness, the BlueMotion model being the most frugal of them all. 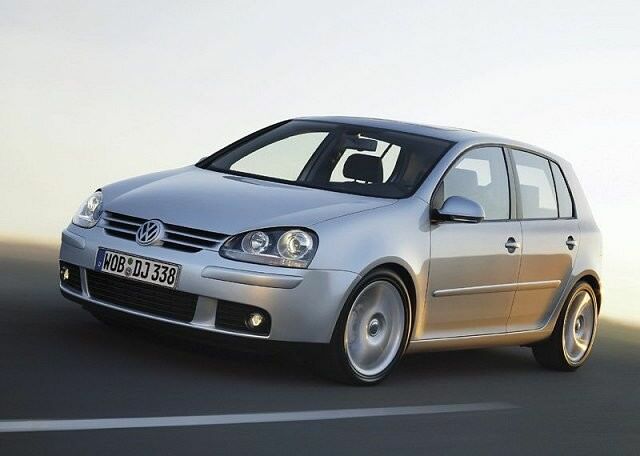 Flagship GTI and R32 models are coveted by enthusiasts and promise big power and lots of fun. Trim levels start at S and rise through Sport, SE, GT and GT Sport. Some top-end models got leather thrown in and were known as GT Sport Leather, while Match versions arrived later in the MkV Golf's lifetime, so they're in shorter supply. You can't beat the 2.0-litre TDI versions for all-round ability. They're potent, tough and cheap to run. Make sure you go for a TDI model rather than an SDI, though. The latter is an old fashioned, naturally aspirated engine, which is incredibly sluggish and undesirable. As for trim levels, you can't go wrong with a middle of the road Sport or SE model. Throw caution to the wind and the legendary GTI can't be ignored for its fun factor. Don't expect the same running costs, though. The Golf's continued success is testament to its all-round appeal. It's practical, reliable and exceptionally well built, all of which add up to create exceptional resale values. If you're after a penny-pinching eco hatch, then that's covered with the BlueMotion, but those who crave something at the devilish end of the spectrum won't be disappointed by the GTI and R32.